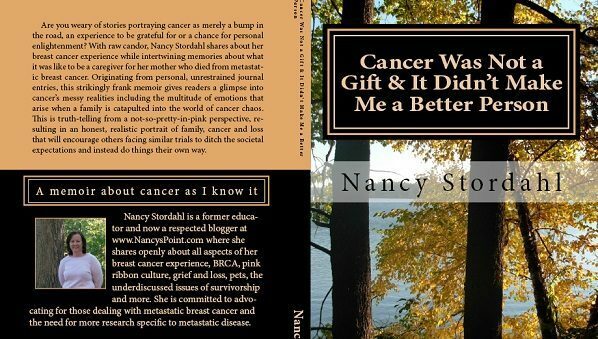 Cancer Was Not a Gift & It Didn’t Make Me a Better Person – It’s Here! Finally, it’s here! After talking about my book for, well, for five years, it’s finally finished and available for you to read! It’s sort of like talking about going on a diet and losing weight. After a while, people say, enough. They expect you to stop talking about it and produce some results. Same deal with writing a book. Eventually, you’re expected to stop talking about it and produce a book. And now I can finally say, I did it. (Maybe some day I can say the same about the weight thing too. I am still working on that). You can click the order now button below to order a pdf version of my memoir. I’d be kidding myself, and you as well, if I said I didn’t care how many copies of my book sell. I do care. But on the other hand, my memoir is a story that needed telling, so regardless of what happens sales-wise, it’s very satisfying to share my “unsanitized” story about cancer as I know it. Memoir is probably my favorite genre, or one of them anyway. I love reading stories about real people and real struggles. One of my favorite memoirs is The Glass Castle by Jeanette Walls. It’s wonderfully bizarre. Another favorite is The Mercy Papers: A Memoir of Three Weeks, by Robin Romm. This one’s about a daughter whose mother dies from metastatic breast cancer. Very raw. Which is exactly why I love it. And a third favorite of mine is A Three Dog Life by Abigail Thomas. This one’s about grief and dogs. So poignant, one to tug at your heartstrings for sure. I highly recommend all three. 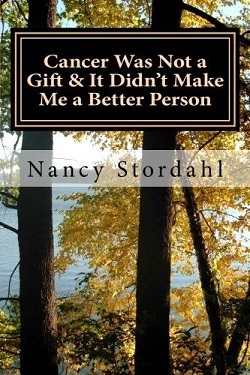 You can purchase Cancer Was Not a Gift & It Didn’t Make Me a Better Person: A memoir about cancer as I know it, here on my site in pdf format. You can also purchase a print copy on Amazon and it is now available on Amazon for Kindle as well. Thank you, dear readers, for inspiring, encouraging and supporting me every day. I couldn’t have done this without you! I hope you will help me spread the news by sharing this post wherever you can. Thank you in advance! Have you read any of the three memoirs I mentioned? Okay, I have to ask, do you have plans to read mine? Sign up for emails/newsletters from Nancy’s Point here. To purchase a print copy, click on image. YAY!! I have been waiting patiently for your book. You bet I am reading it! It is a story I can def. relate to. I allow myself to be me. I think I’ve read “The Glass Castle”. I would love to write my own memoir one day (about my childhood). I started writing short stories but it takes a long time! I just submitted one for publication (for a Journal) — keeping my fingers crossed! Thank you for inspiring me. Your book will welcome others to stay true to themselves. Rebecca, I love your enthusiastic support! Thank you. And thank you for saying you intend to read my book. I hope you do write your memoir; you’re a talented writer and I know it would be well done. Good luck on your submission. Let us know what happens. maybe there will be blog post? Thanks again for the ongoing support. Lindsay, Thank you! And thank you for being my editor and for all the support you’ve given me since way back when I first decided to write my book. I do have plans to read your book. Just bought it. Best of luck with it! Eileen, Thank you so much. I’ll be interested in your thoughts about it. Don’t think too much about – Will it sell?- or, Will “they like me”? – you know, that stupid kind of banter in your head – push the MUTE button. PAUSE, take time to just breathe a sigh of relief. Extend an arm to pat yourself on the back. Deborah, Your words are exactly what I needed to hear about now. Thank you so much. And merry Christmas to you too! Virtual hug received. And reciprocated. What a beautiful gift I feel you have given me! No, cancer has not been a gift! It has changed my life forever and I ask why every day. Thank you, Nancy, for helping me to express myself through your work. I have purchased and am on my way! Mary Ann, Gosh, what lovely things to say. You’re so kind. Thank you so much. And thank you for buying a copy too. The title of your book interests me. Being diagnosed stage IV it feels like cancer is the cruel gift that keeps on giving (taking). Early on someone told me that I was Chosen” and would be a great advocate for this. Ugh. No one is chosen to receive a bad gift. Booby prize. I plan to read your book. It isn’t bitterness. It’s so many other complicated emotions! Melissa, I agree about being “chosen.” Cancer is a horrible booby prize for sure. I’m glad my book’s title interests you and no, it’s not about bitterness. You’re right, it’s way more complicated than that! Thank you for sharing. I will probably get the Kindle version. I’ve been doing most of my reading on Kindle lately. Can’t wait to read it. Congratulations, Nancy! Lisa, Thank you so much. It should be available on Kindle in a week or so. As always, I appreciate your support. Congratulations, Nancy!! I am so happy for you and excited to read your book. I just purchased the paperback from Amazon and can’t wait to get my hands on it. I’ve been reading a lot electronically, including Kindle, and for this, I wanted the actual print book in my hands. There’s nothing like holding a book and turning pages. 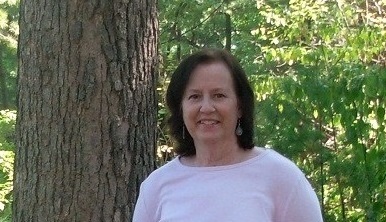 Kathi, It is exciting and rather scary, too, at the same time, as my story is quite personal. But such is the nature of the memoir, and this is exactly why it’s my favorite genre. Thank you for your enthusiastic support, Kathi. It means so much. Congratulations on this momentous milestone, Nancy! I look forward to reading it. Happy Christmas to you and your family! Carolyn, Thank you so much! I certainly appreciate your kind words and your ongoing support. Happy Christmas to you and yours as well! Carrie, Thank you very much. And congrats to your sister-in-law and to you as well. How exciting to make an appearance in the story! I will put it on my to-read list for the New Year. Rebecca, Thank you. I am so glad to hear you are working on a book too. It’s a very interesting process in many ways and I wish you all the luck with it. Even more importantly, good luck with all the cancer stuff you are dealing with. It’s a lot, but you’re not alone. Congratulations Nancy! That’s wonderful news. Mae, Thanks so much. It feels good to have it finished and available for readers.